One of the challenges we faced during the flood that wreaked havoc in our area in 2013 was that our community was separated into "islands" that were physically cut off from each other and the rest of the world by the flood waters. Having lost power, internet, landlines, and cellular service, we also were cut off from communicating with anyone outside our islands, including emergency services. For the better part of three days, we were in a very strange limbo. To address this type of vulnerability in the future, as well as to enhance community emergency preparedness in general, we formed Lyons Prepared△, a volunteer citizen partnership with our Lyons Fire Protection District△. At the recommendation of our fire chief and sheriff's department, we adopted MURS radios△ to provide backup communication between our neighborhoods and local emergency services. My personal desire for even more robust communication capabilities inspired me to also get my ham radio license. 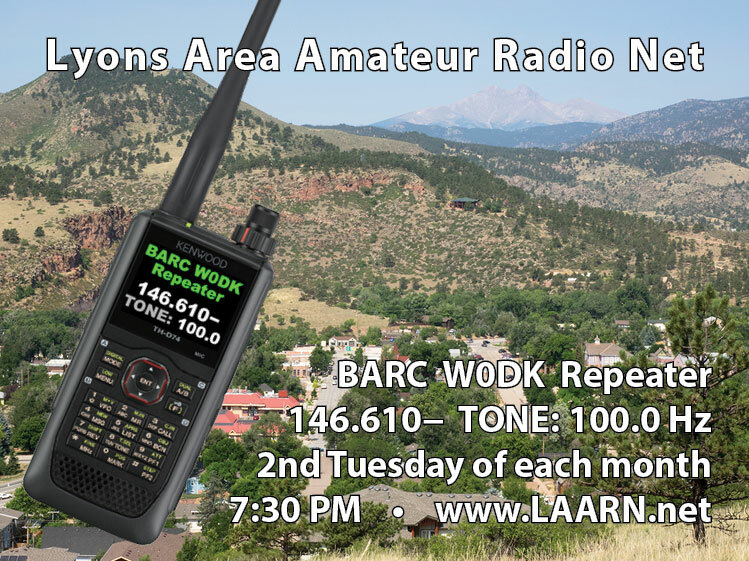 A few of us also started an informal local net to strengthen the ham radio network in our area: Lyons Area Amateur Radio Net△. 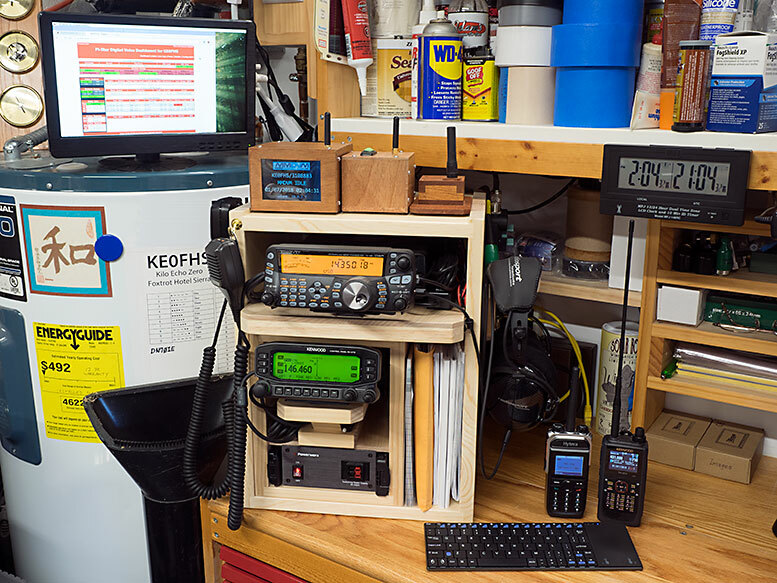 As I've gotten more involved in amateur radio, I've grown to appreciate what unique and wonderful opportunities it presents to serve our communities, learn new things, and have a good time. Many thanks to my many mentors! Many hams, mentioned throughout these pages, have been mentoring me. I deeply appreciate their generosity and patience. General license renewal date: July 31, 2025. Although I'm still relatively new to the universe of amateur radio, I've already enjoyed enough interesting learning experiences as well as stubbed my toes enough times to have gained a few insights. I'm a non-technical user figuring things out as I go along, and I also don't have a great memory*, so I'm writing these notes as my way to keep track of what I'm learning (and also just for fun, as I love writing as much as learning). Basically, this is a collection of info I wish I had found online when I was browsing for insights. [*] Well, perhaps my memory is normal△ … or even a good thing△: "In fact," Wimber says, "it's been shown over and over in computational models and also in animal work that an intelligent memory system needs forgetting." Yep, I'm a bit scrappy. My shack is a corner of a desk in my workshop, which is primarily a haven for my woodworking passion. My small shop is so full of woodworking tools that there's not a lot of free space, so I have to make use of every cubic inch, for example, the monitor I use when logging into the Raspberry Pi is balanced (securely) on top of the water heater next to my desk, and a phonetic alphabet chart is taped to the side of that water heater. Hey, it works! 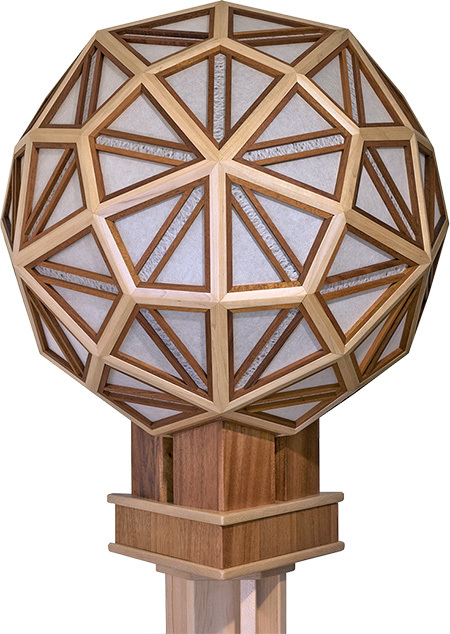 Aside: Here's a glimpse of my most recent woodworking project, the Windtraveler, a floor-standing shoji lamp made from maple and mahogany in the shape of a deltoidal hexecontahedron. 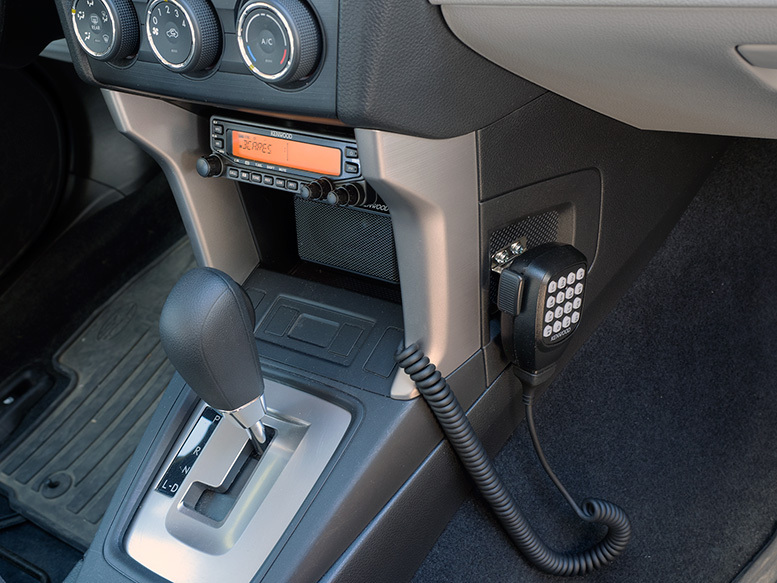 I'm not much of a car guy, so I'm pretty satisfied with (and a little surprised by) how well my installation of a Kenwood TM-V71A turned out, thanks to a combination of lots of sweat and even more luck. When I first dove into D‑STAR, I knew nearly nothing about digital voice and quickly found myself drowning in a big bowl of bewilderingly murky information soup. If it's so bewildering, why even bother? I'll jump a bit ahead here and share one tidbit: at one point early in my exploration of D‑STAR, I linked to a reflector and heard a guy in San Diego, California chatting with a chap in Yorkshire, England. That was the moment I became hooked. Just think of it: worldwide communication with a Technician class license, a bit of effort and learning, and some fairly simple equipment! 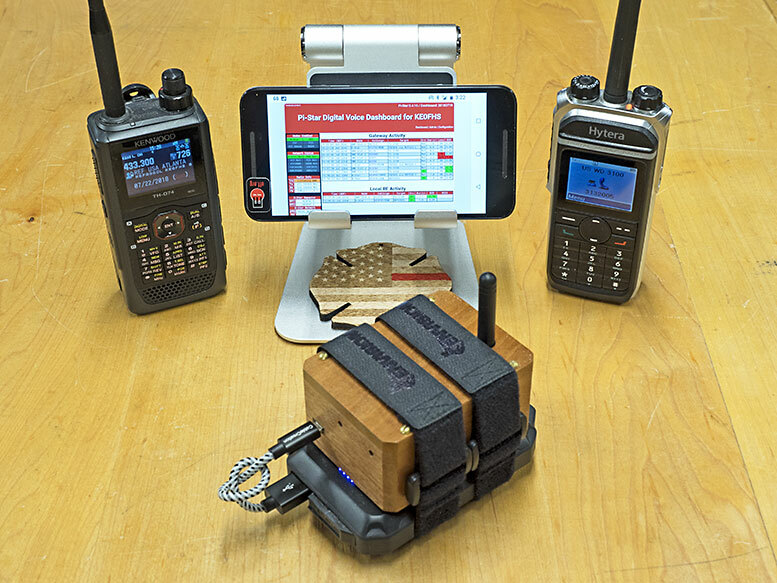 After weeks of intense learning and effort, I felt like I was just beginning to get a handle on D-STAR, having put together a nicely working solution for my shack as well as for mobile. So why did I so quickly adventure off in a new direction? I guess I must be a bit crazy, but a learning opportunity presented itself, so I decided to dive right back into another bowl of baffling info-soup and learn how to swim all over again, this time in the DMR soup bowl. 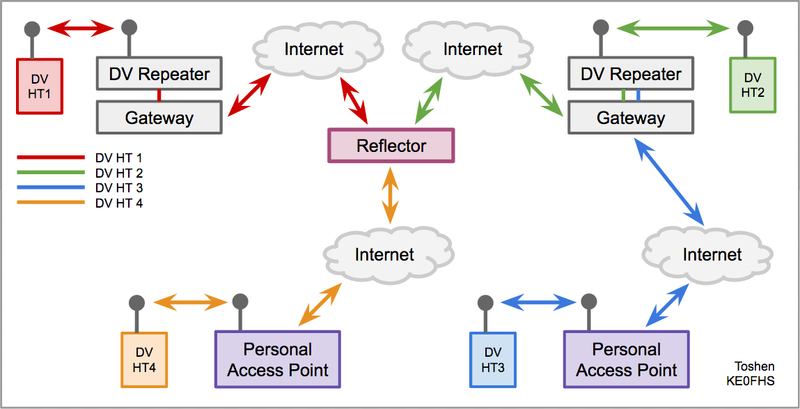 A hotspot (personal access point) is a combination of hardware, firmware, and software that enables a ham with internet connectivity to link directly to digital voice (DV) systems around the world. Hotspots can link to DV repeaters, DMR talkgroups and reflectors, D-STAR reflectors, YSF rooms, QuadNet Smart Groups, and so on. Basically, hotspots act as your own personal digital voice repeater and gateway, which can be really fun. 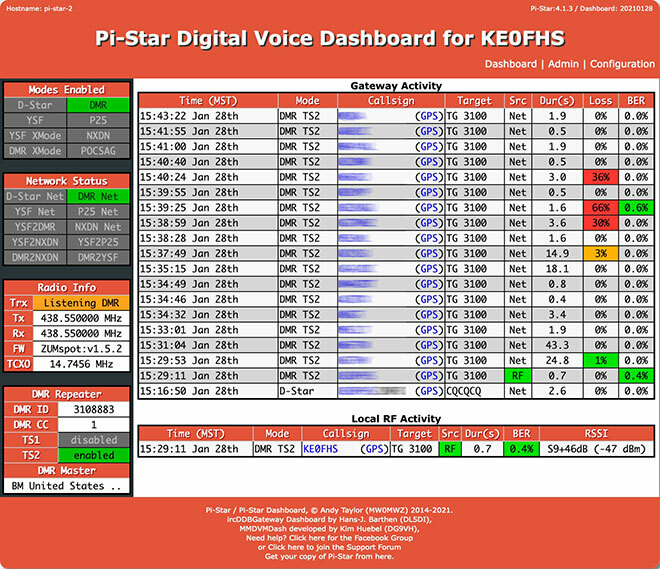 Pi-Star is great software for digital voice hotspots and repeaters. It can handle DMR, D-STAR, and YSF, and when used with an MMDVM-capable modem, even P25, NXDN, and POCSAG, as well as YSF and DMR cross modes. Paired with a compact board like the ZUMspot△, Pi-Star is a great solution for use both as a base station and as a mobile hotspot. "an enigma wrapped within a riddle,"
which I enjoy for its playful flair.